Here is a painting of colorful autumn leaves found on one of my walks through the countryside. The oak leaf is still green, but the maples have turned lovely shades of red and gold.The leaves are set off by a rich, deep background. Taking a leaf, paint the underside first with a thin layer of dish soap to make the watercolor stick more easily, then with watercolor. 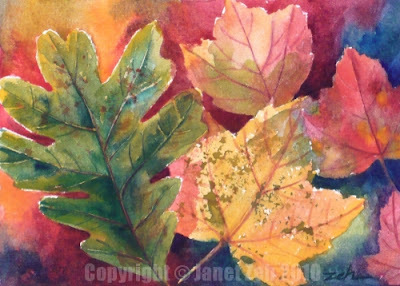 Put the leaf paint side down on the watercolor paper and hold it there with one hand. With your brush and some rich color, paint out from the leaf all around it to do part of the background. The leaf acts as a template. Remove the leaf - your leaf will be white with splotches - and repeat with another leaf, overlapping a little. Repeat several times. Paint the leaves - they will already have some background color in them - and add veins and other details. Deepen the background color around the leaves to define them and make them pop out. You can see more of my work at ZehOriginalArt.com. Thanks for stopping by today!